Chairman Warner, Ranking Member Johanns, honorable members of the Subcommittee, thank you for this opportunity to share my views with you on the euro-area crisis and its implications for the United States. I have organized my remarks as follows: in the first section I elaborate on the origin of the crisis and provide a basic chronology of the main events until the downgrade by Standard & Poor’s of Italy’s sovereign bonds on Monday. In the following section, I focus on the policy response, highlighting the many gaps that still persist and proposing a multi-pronged strategy consisting of immediate as well as short- and medium-term measures. Finally, in the last section, I focus on the implications for the U.S. economy and elaborate on the diplomatic and institutional levers that the U.S. can mobilize to affect current developments in Europe. What started in the fall of 2009 as a fiscal crisis in a smaller European economy—Greece, accounting for just 2 percent of the total area’s GDP—has evolved into a systemic crisis of the euro-area itself. This crisis now threatens not just to melt down one of the world’s major economies, but to destroy the social and political fabric that several generations of European political leaders have laid down with the unwavering friendship of the United States since the end of WW II. 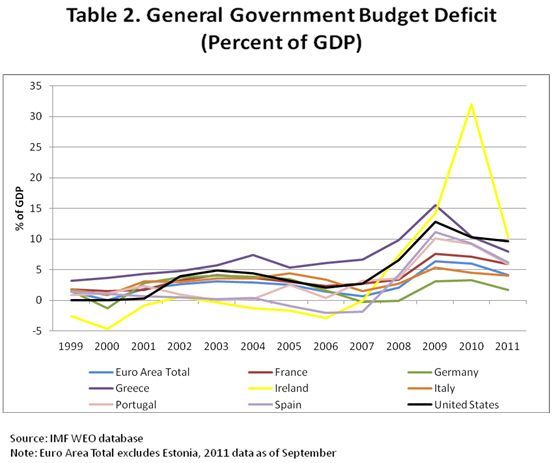 In October 2009, when Greece’s newly elected Socialist government revised the estimate for that year’s budget deficit from 6.7 percent of GDP up to a whopping 12.7 percent of GDP, and then further revised to above 15 percent, credit-rating agencies began downgrading Greek bonds while investors faced increasing concerns about the country’s high debt and about allegations that the Greek government had altered official statistics so as to enable spending beyond the country’s means (Tables 1 and 2). In May 2010, a loan agreement between the euro-area countries, the IMF, and the Greek government was announced in the amount of EUR110 billion, of which EUR80 billion would be financed by the euro-area countries and EUR30 billion by the IMF. The inertia from the euro area in assembling a stabilization program for Greece until almost the middle of the following year focused market investors and analysts on the vulnerabilities of other countries sharing the single European currency. A few months later, Portugal and Ireland had to request a stabilization program from the IMF and the EU. Following intense economic and financial pressures, triggered by a critically-weakened banking sector in Ireland, public finances were weighed down by a deep fiscal deficit as a result of commitments to bank support. In late November 2010, an agreement was reached between the IMF, the EU, and the Irish authorities on a policy package of EUR85 billion for the period 2010-2013, of which EUR22.5 billion would be funded by the IMF. 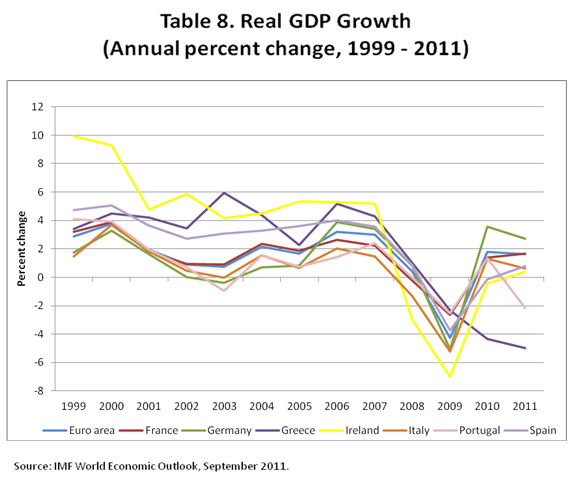 Portugal was the third member of the euro area to seek assistance from the IMF and the EU. Its long-standing structural problems—including low productivity, lack of competitiveness, and high unemployment—had severely undermined its growth, which averaged only 1 percent during the previous ten years. The lack of growth, combined with the impact of the global financial crisis, had resulted in a large fiscal deficit and high levels of debt (Tables 1 and 2). The joint EU-IMF financial package agreed for the period 2011-2014 was for EUR 78 billion, of which one third committed by the IMF. Late this summer, market pressure on Italy escalated and the spreads of its government bonds vis-à-vis the German Bund widened to over 400 basis points—levels not seen since the introduction of the euro (Table 13). As a result, the Italian authorities put forward two supplementary budget plans in less than two months—the latter having been approved by the Parliament only days ago. Soon afterwards, just this Monday in fact, Standard & Poor’s downgraded the country’s sovereign rating, keeping it on a “negative outlook,” which may prompt a further downgrade over the coming weeks. Other large sovereigns have also been affected. 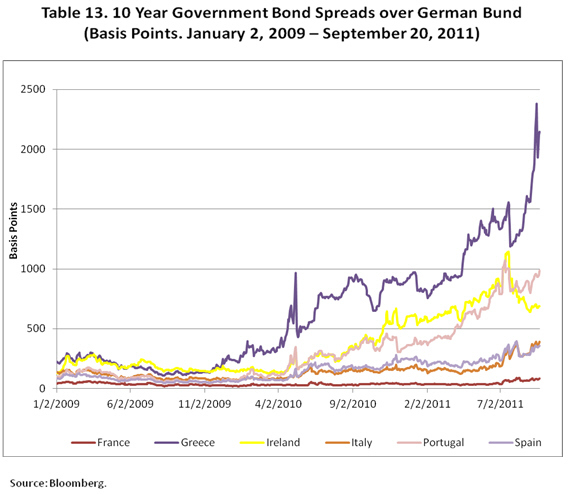 French government bond spreads have risen vis-à-vis the Bund, albeit by far less than Italy’s. Last week, two large French banks were also downgraded on account of their exposure to the distressed peripheral economies of the euro area. While interest rates on German government bonds have been decreasing, it would be inaccurate to say that Germany has not been affected by the euro-area turmoil. Following a strong rebound of 3.6 percent last year in the aftermath of the international financial crisis, Germany’s GDP growth will be subdued this year at an estimated 2.7 percent, and will further decline to 1.3 percent next year, according to the data released by the IMF on Tuesday (Table 8). The stabilization programs pursued by the economies in distress and the fiscal retrenchment enacted by the rest of the euro area will, moreover, increasingly affect the ability of German manufacturers to export their products in the area. Compounded with increasing uncertainty, this is likely to result, at the very least, in a slowing down of the German GDP growth for the next few years—as a best-case scenario and barring significant repercussions in its financial sector. While the national governments are obviously primarily responsible for the unfolding of the current events in Europe, the incomplete architecture of the euro area has created unprecedented scope for contagion by exposing each member of the monetary union—albeit to varying degrees—to the vulnerabilities of the other members. Italy is a case in point. 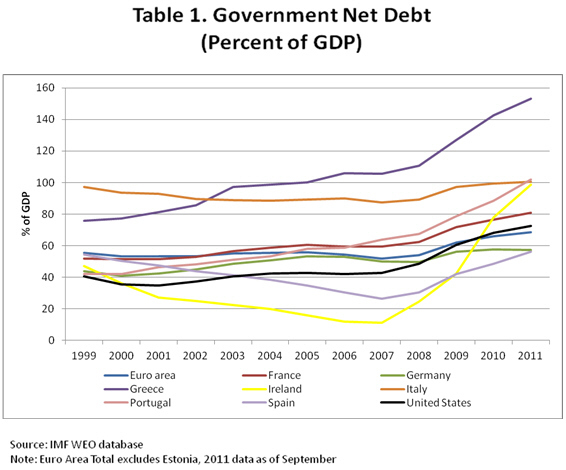 While the sluggish growth of its economy and the high-level (and increasing) public debt are not new phenomena, the crisis of the peripheral economies has provided the trigger for market investors to focus on the Italian economy’s long-run ability to service an increasing stock of public debt. Coupled with the inexistence of a lender of last resort, market expectations can rapidly become self-fulfilling in the euro area. As the Greek crisis reached its peak, the EU, concerned about contagion risks within euro zone countries, came forward in May 2010 with a broad package of measures worth EUR500 billion to preserve financial stability in the region. In addition, the IMF expressed its aim to support such financing arrangements with an additional EUR250 billion, bringing the total amount of the “safety net” to EUR750 billion. The European Council also established a special-purpose vehicle, the European Financial Stability Facility (EFSF), which was incorporated weeks later in Luxembourg, with the objective to provide temporary financial assistance to euro-area partners. The EFSF became fully operational on August 4, 2010, and is designed to operate for three years. It is authorized to issue bonds and/or other debt instruments on the market, with the support of the German Debt Management Office (DMO). Issues are to be backed by guarantees from euro-area countries, for a total amount not to exceed EUR440 billion. In September 2010, EFSF bonds were assigned the top credit rating (AAA) by rating agencies. EFSF debt instruments can be used as collateral in refinancing operations through the European Central Bank. The EFSF is not a preferred creditor along the lines of the IMF. Its claims on a particular country have the same standing as any other sovereign claim. If too many creditors were granted preferred status, private investors would be reluctant to offer loans to the country concerned. The EFSF has a very lean structure, with a staff of only about a dozen people, made possible because the German DMO and the European Investment Bank both provide the EFSF support. The board of the EFSF is made up of high-level representatives—Deputy Ministers or Secretaries of State or director generals of national treasuries—from the 16 euro-area Member States. Observers from both the European Commission and the ECB also sit on the EFSF board, which is chaired by the EU’s Economic and Financial Committee Chairman. The euro zone summit held on July 21, 2011 widened the EFSF’s scope of activity by allowing it to: i) act on the basis of a precautionary program; ii) finance recapitalization of financial institutions through loans to governments, including in non-program countries; and iii) intervene in the secondary markets on the basis of exceptional financial market circumstances and risks to financial stability, or on the basis of a mutual decision by the EFSF Member States, to avoid contagion. Earlier on, at their summit on June 24, 2011, EU Heads of State and Government had also decided that the EFSF may intervene in exceptional circumstances in the debt primary market, in the context of a program with strict conditionality. These amendments are still not operational as they await approval by national legislatures. It is expected that they may enter into effect sometime in October, at the earliest. Meanwhile, a recent decision by the German Constitutional Court appears to preclude the possibility that Germany will join the new permanent crisis mechanism, the European Stability Mechanism, which EU Heads of State and Government decided to establish on June 24 as a successor to the temporary EFSF. Moreover, earlier in the summer, euro-area leaders had agreed to a follow-up program for Greece on the order of EUR100 billion, which also awaits parliamentary approval. The German Parliament is expected the program sometime in October. Uncertainty exists as to whether, under what terms, and in what proportion the IMF might join such a program. The European Central Bank Governing Council has taken extraordinary measures in filling a political and institutional vacuum. In the period from May 2010 to April 2011, the Eurosystem—the ECB and the euro-area’s national central banks—conducted open market purchases of Greek, Irish, and Portuguese bonds for EUR78 billion through the Securities Market Program (SMP). Following escalating market pressures on Italy and Spain over the summer, the Eurosystem reactivated the SMP by intervening for EUR80 billion as of September 16, 2011. Unofficial reports from trading desks suggest that approximately 65 percent has been spent to buy Italian government bonds, 30 percent to buy Spanish bonds, and the remaining 5 percent for Ireland and Portugal bonds. While the ECB has not disclosed for how long it intends to continue the SMP, it is reasonable to assume that it may plan to do so until the EFSF will be able to step in, following ratifications of recent amendments noted above. The ECB has also intervened to ease pressures on European banks in the U.S. dollar funding market. At the end of June, the ECB extended the liquidity swap arrangement with the U.S. Federal Reserve to provide U.S. dollar liquidity to those banks unable to access the interbank dollar market. Research conducted by Barclays Capital (Euro Money Markets Weekly) reports that some European banks have recently been using ECB dollar facilities. Admittedly, the institutional framework established at the outset for the single European currency did not include a safety pillar such as an EFSF-type mechanism. This is mainly a reflection of the assumption, not fulfilled ex post, that subsequent to the introduction of the euro, the overall stability of the euro zone would be underpinned by a sustained convergence toward a unique policy process—one that would go well beyond monetary policy and would be geared toward macroeconomic stability. This expectation has not materialized, as economic policies have diverged. More than a year after the establishment of the EFSF, there are still no emergency instruments for intervening in support of large sovereigns, like Italy, should market pressure significantly escalate in the coming weeks or months. Given that the EFSF has currently committed some EUR175 billion—based on estimates from Barclays Capital Research—of its EUR440 billion potential endowment, the remaining EUR265 billion would be insufficient to ring-fence Italy, should it be cut off from markets. In 2012 alone, the Italian Treasury will need to provision an amount of, at least, EUR235 billion, excluding T-bills (Buoni Ordinari del Tesoro). Assuming an approximately similar amount for 2013, this implies that a hypothetical joint two-year EU-IMF program would deplete both the EFSF and the IMF. The resources of the latter were, as of September 15, SDR246 billion (or about EUR290 billion) in terms of its forward commitment capacity. Oddly enough, if euro-area countries were to step up their guarantees in any substantial way to make the EFSF a viable financing instrument for large sovereigns, the contingent fiscal liabilities that would arise for each euro-area member would increase proportionally by a few percentage points of GDP. For France, this could entail losing the AAA status. In other words, in an attempt to stabilize Italy, France could make itself more vulnerable. As a result, Italy, and other large sovereigns, is currently exposed to self-fulfilling market runs against which there are no safety net, unless the ECB were to monetize public debt, which it is prevented from doing. Against this background, an effective, credible, and comprehensive response would need to rely on three pillars of emergency, short- and medium-term measures. In the immediate, the EFSF should be strengthened by implementing the decisions already agreed upon by euro-area leaders during the summer. Further reforms should also be introduced to step up the decision-making, operational, and financial capabilities of the EFSF so as to stabilize market expectations about the euro-area’s immediate-response firepower. The EFSF suffers, in fact, from a number of limitations. Its governance is symptomatic of a purely intergovernmental approach to the management of the euro-area crisis, with lending decisions requiring the unanimous approval of all the euro-area countries. Yet, one of the key reasons for the current crisis is precisely the fact that markets have very deep reservations about the credibility of a monetary union run on the basis of an intergovernmental approach rather than a federalist one. As for its financial capability, the EFSF funds its lending programs by issuing bonds guaranteed by its euro-area shareholders. As a result, subscriptions to the EFSF’s bond issuances cannot be taken for granted in the case of a systemic crisis, where contagion to otherwise healthy national financial markets is a serious possibility. Even when the EFSF can borrow from markets, its financial capability is severely constrained by the time lag needed to provision resources from the markets. As has been suggested, the possibility of acceding to a credit line by the ECB would, instead, confer easy and timely access to funding, would enable the EFSF to amplify its financial capacity by leveraging on that funding, and would relieve the ECB of the role of crisis lender, which is outside its mandate. Admittedly, uncertainty would still persist against the lack of a lender of last resort, which would be needed to stabilize large sovereigns with substantial refinancing needs, should they be hit by a severe liquidity crisis. Moreover, euro-area leaders and the Greek authorities would need to establish the sustainability of any new follow-up program. The Greek debt-to-GDP ratio is currently projected to reach over 140 percent; under these conditions, it is simply impossible for the Greek economy to return to a sound footing—all the more so given that monetary and exchange rate policies are outside the control of the authorities. A more extensive engagement by the private sector (i.e. “orderly default”) is required to decrease the ratio to a lower, sustainable level. The enhanced EFSF could provide the resources to strengthen the European banks that will have to write off part of the Greek debt. As long as the Greek crisis is not credibly reigned in, uncertainty will persist as to whether other euro-area economies may be stabilized, regardless of the required efforts that their national authorities have to implement. In the short-term, the euro area would need to establish a framework for pooling the fiscal sovereignty of euro-area members. This would not need to result in a euro-area-wide finance ministry. Rather, a centralized entity such as the European Commission should be allowed to vet national fiscal policies or strategies on behalf of the euro area as a whole and on the basis of commonly agreed-upon and binding criteria. In return, member countries could issue eurobonds, that is, government bonds backed by a common, euro-area-wide guarantee, up to a certain threshold, such as, for instance, 60 percent of GDP, as has been suggested. Admittedly, the issuance of eurobonds alone, without the safeguards afforded by the centralized vetting, would not stabilize all euro-area countries. For instance, with a debt-to-GDP ratio of 120 percent or EUR1.9 trillion in absolute value, Italy would still need to issue the upper 60 percent tranche of its debt under the current framework of nationally-guaranteed bonds. In other words, from Italy alone, there would be almost EUR1 trillion in bonds floating with no euro-area guarantee. In the medium term, euro-area countries should establish a coordinating framework that would go beyond fiscal policies by encompassing macroeconomic and structural policies. In fact, this is required to ensure that aggregate demand is sustained over time and that national economies do not pursue policies that are inconsistent at the euro-area level. Along those lines, for instance, some euro-area economies like Germany cannot expect to run a persistent surplus in their current accounts while other economies of the area have to reduce their aggregate demand and, therefore, their imports from Germany as well. Accordingly, the latter could balance the reduced demand from the rest of the euro area by expanding its own domestic demand. This would have the advantage of supporting the rest of the euro-area economies that would otherwise be facing substantial retrenchment for years to come. 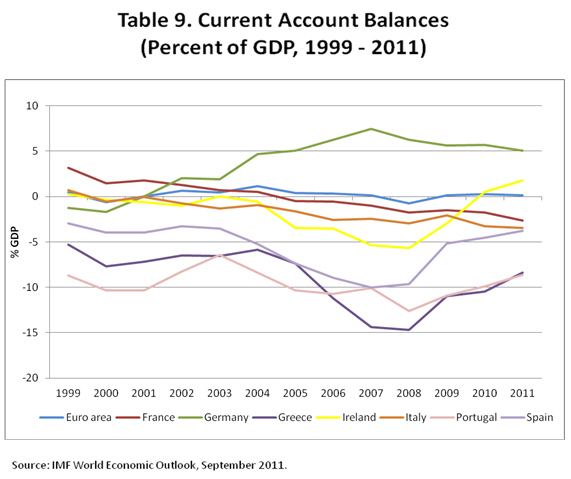 Up to now, there has been no mechanism to balance current accounts within the euro area. Germany has been able to accumulate consist surpluses, even greater than those of China in proportion to GDP, without the restrictions of a compensatory mechanism provided by exchange-rate appreciation, such as that in play during the 1970s and 1990s with the German mark. 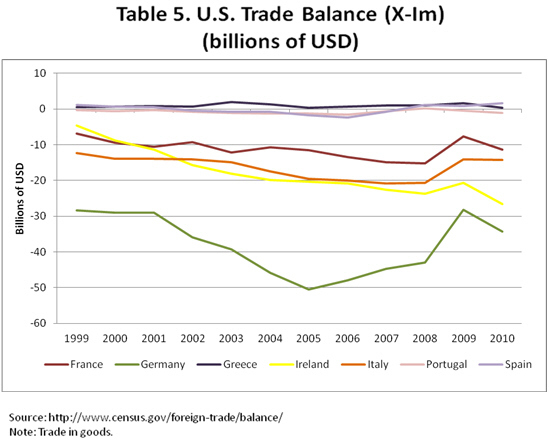 Because of this asymmetry, Germany multiplied the benefits for its economy after the introduction of the single currency, with current account balances consistently in surplus and for the most part on the rise, reaching about 6 percent of GDP in 2010 (Table 9). During the three-year period 2006-2008, the balance was even greater, representing a historical high for Germany, at least with respect to the last 40 years. On the other hand, the current account balance with respect to GDP of the euro area in general has hovered, on average, around zero over the course of the past decade, without therefore generating any direct pressure for a compensatory adjustment in the exchange rate of the single currency. 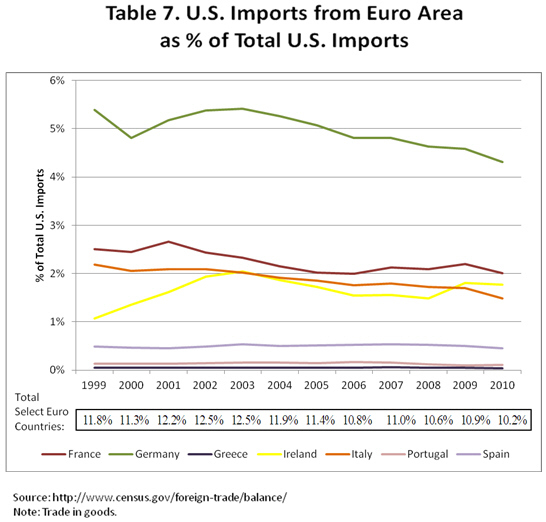 Never has this asymmetry been more evident than at the height of the international financial crisis, when the German economy benefitted from a considerable increase in exports outside the euro area. Over the course of 2010, taking advantage of a relatively weaker euro—by 9 percent compared to the year before, in real terms—manufacturing orders from beyond the euro area for German firms reached their highest in a decade. 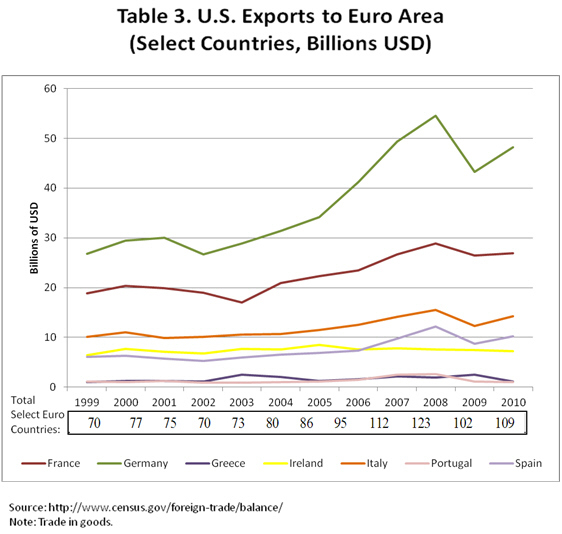 The U.S. exports goods to the euro area for approximately US$100 billion (Table 3) or a bit less than 10 percent of its total goods exports (Table 6). They are mostly skewed towards Germany, France, and, also, Italy. 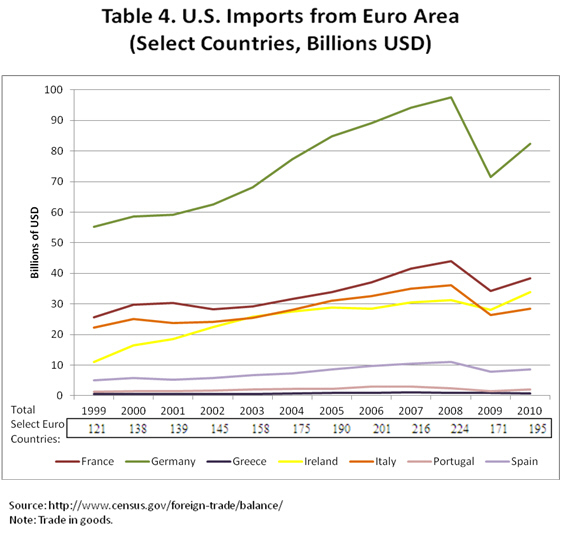 Flagging demand in Europe due to a gloomy outlook and increasing uncertainty is likely to result in fewer exports, thus increasing the fragility of the U.S. economic recovery. 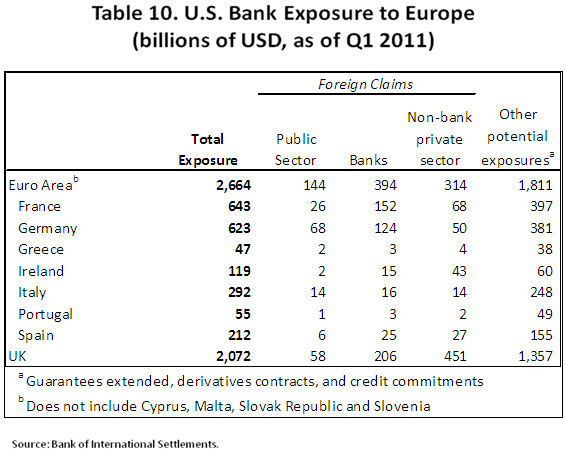 From a financial standpoint, U.S. banks are exposed to the euro area for US$2.7 trillion, largely reflecting claims towards France (US$643 billion) and Germany (US$623 billion) (see Table 10). These claims account for 29 percent of the U.S. total exposure to foreign counterparts (Table 11). 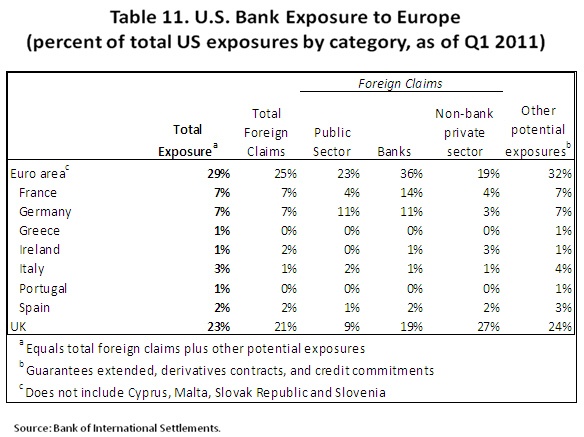 Exposure to France and Germany accounts for 14 percent altogether of total foreign exposure (Table 11). 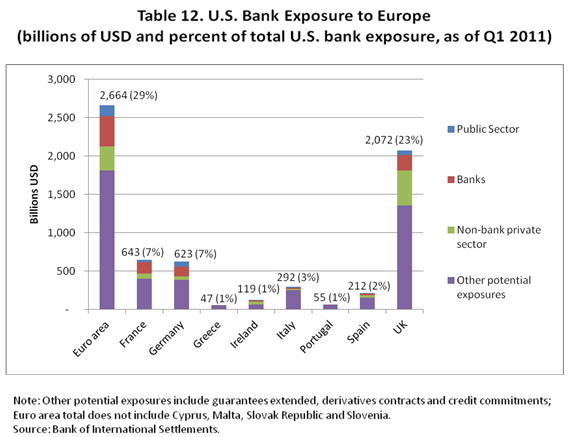 U.S. banks are also exposed to the U.K. for some US$2 trillion or 23 percent of their total foreign exposure (Tables 10 and 11). Exposure to the peripheral economies under stress is modest—claims on Greece, Ireland, and Portugal account for 3 percent of total foreign exposure (Table 11). Therefore, any significant impact to the U.S. banking system would accrue through the largest euro-area sovereigns, once or if the crisis becomes a fully-blown systemic one. Accordingly, there is still an important window of opportunity that the U.S. may use in trying to stabilize the euro-area crisis. While, of course, any resolution of the euro-area crisis ultimately hinges on the European countries themselves, the United States can rely on the following levers to affect the current developments. 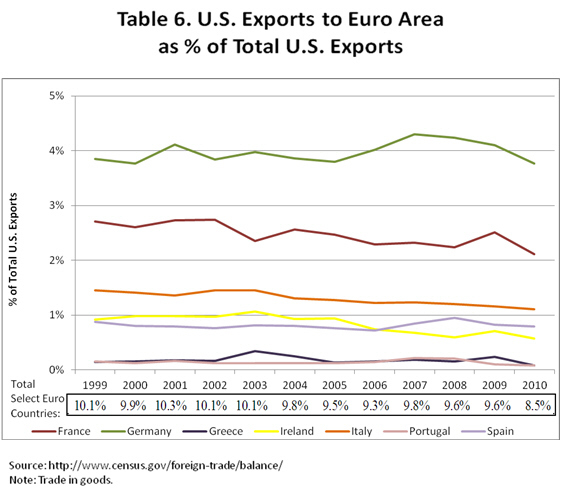 Euro-area countries are traditional allies to the United States, with whom the U.S. has developed longstanding diplomatic and working relationships. The press has reported regular conference calls and meetings between senior officials of the current administration and their respective European counterparts. The President has reportedly engaged European political leaders on a regular basis. Perhaps it is not a coincidence that German Chancellor Merkel publicly announced support for the first rescue program for Greece in the spring of last year, following a conference call with the U.S. president the very same day. Regardless of whether the G-20 gets formally involved in the European crisis, it could still fulfill a very important coordinating role. In September 2009, the United States launched the Framework for a Strong, Sustainable, and Balanced Growth. The rebalancing of global demand through some large emerging economies’ switching to a greater extent to domestic sources for their economic growth becomes a more urgent issue against flagging demand in Europe and the increasing fragility of the U.S. economic rebound. Today and in the next few days, the G-20 will meet at the margins of the IMF and World Bank Annual Meetings. It is important that the G-20 makes tangible progress on global rebalancing by the time of the forthcoming summit in Cannes in early November. There is, however, a sense that expectations should be low as progress may not materialize. The G-7 has been increasingly active in the context of the European crisis and has represented the international forum where Continental European countries have exchanged views with other nations on the developments unfolding in Europe. The longstanding, small network of G-7 officials provides a more intimate forum in contrast with the G-20, and the Europeans themselves regard this forum as better suited to have internationally-broad discussions with traditional allies. The U.S. has used this forum to persuade the Europeans and to prod them to a credible and urgent course of action. Following the latest recent financial summit in France, the G-7 will meet again at the margins of this week’s IMF and World Bank Annual Meetings. The IMF represents an important source of leverage for the United States, given its status as the largest shareholder. The U.S. appoints an Executive Director in the Executive Board. Moreover, the post of First Deputy Managing Directorship has always been filled by an American citizen, since the position was established in the 1990s. Given its role of overseer of the stability of the global financial and monetary system, the IMF has not just the right, but the duty, to intervene—on its own terms—in the current developments. Its role goes well beyond lending and falls under its original surveillance mandate. The IMF has jointly funded, with the EU, all the programs in the distressed euro-area economies. Whether or not it will join future programs is a matter the Executive Board will have to decide on. Regardless of future lending commitments, however, the confidence-building effect from a step up in the Fund’s financial capacity should be seriously considered. Just as the G-20 leaders fortified the IMF’s financial position with an extraordinary injection of capital following the London Summit in April 2009, the membership of the IMF should, at the very least, implement the reform package already agreed on by the IMF Board of Governors in December 2010 and previously endorsed by the G-20 leaders in Seoul the month before. Once approved, IMF resources will increase from SDR238.4 billion to approximately SDR476.8 billion (about US$750 billion). As part of the agreement, moreover, Western European countries will release two seats on the Executive Board in favor of emerging and developing countries. The United States has not yet ratified this agreement. The IMF also relies on contingent credit lines through the New Arrangements to Borrow. In the event the Fund needs to readily supplement its permanent resources, the NAB is a first-recourse facility. Once activated, it can provide supplementary resources of up to SDR367.5 billion (about US$580 billion) to the IMF. The NAB was activated last spring for a period of six months, in the amount of SDR 211 billion (about US$333 billion). The United States contributes with SDR69 billion (approximately US$100 billion). Given the prospect of a meltdown of the euro-area, the NAB provides a fundamental backstop to the IMF’s lending capacity, even more so as the final ratification of the doubling in IMF quotas will inevitably require several more months, at least. The Fed has provided the ECB with dollar funding through currency swap operations since the outbreak of the international financial crisis, to enable the ECB to provide U.S. dollar funding to euro-area banks. In May 2010, the ECB reintroduced this form of transaction, as the Greek crisis led to tensions in the U.S. dollar liquidity market for European banks. In January 2011, the ECB then dropped the facility to reintroduce it again this summer. Accordingly, at the end of June 2011, the liquidity-swap arrangements between the ECB and the Fed were extended to August of next year. Notably, the Federal Reserve’s cooperation lent to the ECB allows European financial institutions to meet their counterparty or loan obligations in U.S. dollars thus minimizing the risk of contagion in U.S. markets. The extension of these credit lines does not expose the Federal Reserve to foreign exchange or private bank risk. When the Federal Reserve provides dollars through the reciprocal currency swaps, they provide them to the ECB, not to the institutions obtaining funding through the liquidity operations tendered by the ECB. Nor does the Federal Reserve assume any exchange-rate risk, because the supplying of dollars in exchange for foreign currency, and the subsequent receipt of dollars in exchange for foreign currency at the swap’s maturity date, take place at the same rate of foreign exchange. See, for instance, the Dow Jones wire available at: http://www.foxbusiness.com/industries/2011/07/19/in-flurry-calls-g7-governments-signal-eu-meeting-critical/.